Chicago-based artist Christopher Baker’s work investigates the harmonisation of human outreach through technology. Baker’s scientific background, in which he contributed to the development of brain-computer interfaces at the University of Minnesota and UCLA, is partly responsible for his analytical approach. First exploring his interests in an experiment orchestrating electronic sound in his 2003 project 'Love Anticipated', the nature of his work had developed into a wider concern in 2008, choosing to focus on the mobilisation of individuals now able to voice their opinions and experiences from bedrooms and offices to an audience across the globe. To mark the opening of Saatchi Screen, the Saatchi Gallery’s first film and video screening room in partnership with The Cardogan Estate and Hugo Boss, located at Duke of York Square, they have chosen Baker’s 2008 project 'Hello World! or: How I Learned to Stop Listening and Love the Noise' as their debut screening; the project’s first screening in the UK. With a Master of Fine Arts in Experimental and Media Arts at the University of Minnesota, Baker is now undertaking an Assistant Professor role in Art and Technology Studies at the University of Minneapolis including working with the Kitchen of Budapest in Hungary and Minneapolis College of Art and Design. Dazed Digital: How has your scientific background influenced your perspective as an artist? Christopher Baker: As divergent as it may appear at first glance, my motivations haven't changed drastically since dedicating myself to art. I continue to be interested in the ways that new technologies affect our perceptions of self -- particularly in the ways that technologies expand and extend our capabilities as humans. I think my background in science has also really influenced the way that I think about science and technology as perpetually "improving". From the perspective of engineers and scientists in a lab, one could say that it does continually improve, but from the perspective of a culture at large, each improvement seems to bring a truly complex response. Thus as an artist, I feel like I can better understand the motivation of scientists and more carefully approach ideas of technological determinism. DD: What interests you about the idea of collective public contribution of opinion to video based websites such as youtube? Christopher Baker: I am interested in the promise of this technology to give formerly marginalised people the opportunity to be heard. This is incredibly attractive from a social justice and democratic perspective, but with each new speaker the cumulative effect is to drown out other speakers. I am most interested in the way that the creating a video makes the speaker feel as well. Do they feel like they are contributing to something? Or, is it simply enough to speak and have one's voice heard? DD: What does the combination of individual video diaries and their presentation within the installation communicate to audiences? Christopher Baker: There are two main reactions that I see in the audience. One is a sense of optimism. 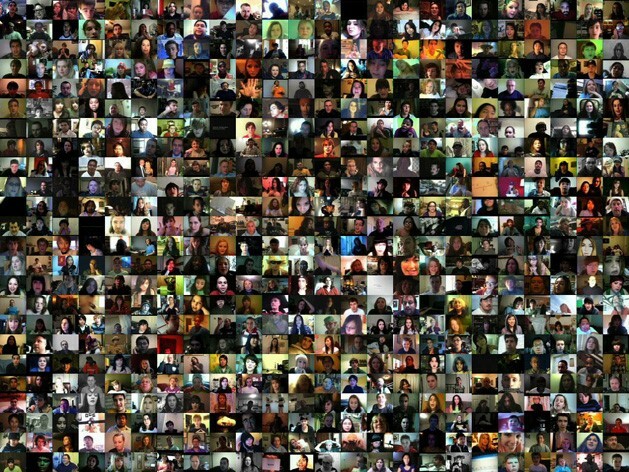 Some viewers are energised by the quantity and variety of participants on the internet. Others are a bit overwhelmed by the massive quantity of speakers and find it a bit depressing. Personally, I am glad that both responses are present. DD: There is a theme of harmony in regard to collaborative efforts through technology in your work. How do you perceive the collaborative nature of social networking channels and what problems do they pose? Christopher Baker: I think there is a lot of potential -- and clearly social networks are very effective communication tools. It makes it possible to spread a message and organise groups very quickly. But while these technologies make us more effective speakers, they don't really teach us to be better more thoughtful listeners. So, if one can argue that real democratic change is best served by conversation, then I feel that social networks are still lacking from a dialogical perspective. It seems like we've created technologies that effectively amplify the voices of individuals, but we have yet to create technologies that enhance our ability to listen thoughtfully. DD: How do you envisage new technologies influencing art in the future? Christopher Baker: I think an emerging issue over the next few years will revolve around memory and the ways that our memory and identity as humans will change when our (for instance) Facebook timelines become very very long. "Forgetting" is an important part of being human... and so many new technologies seem to work against the idea of forgetting... which makes them all the more attractive and repulsive at the same time.